On 19-22 January 2015, I’ll be playing local host to the first Sounds~Write linguistic phonics training to be held in Melbourne. I’ve also just confirmed that the last day of this course will be presented by John Walker, one of the UK authors of Sounds~Write. So in the unlikely event that someone does find a question on the head of a pin that Mary can’t answer, John will be able to answer it. You can hear John and others talk about Sounds~Write on video by clicking here, and there’s lots of other information about the program on the Sounds~Write website. 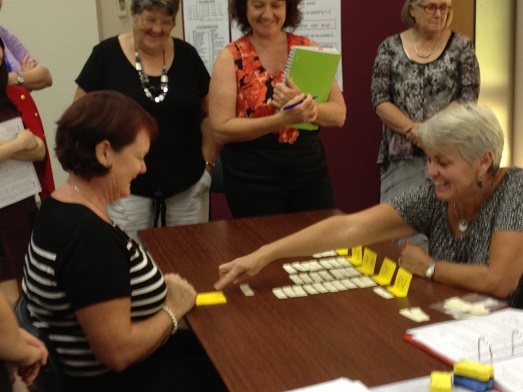 I’m not planning to make money from this course, just provide local teachers and interested others with access to this evidence-based linguistic phonics training, and thank John, Mary and DSF in Perth for waiving my course fee when I did this training earlier in the year (airfare + accommodation + missed work days + course fee would have made it prohibitive). I’m also considering becoming a Sounds~Write trainer myself, because I think it’s exactly the kind of tried-and-true course for teachers we need running here in Victoria on a regular basis. Interest in the Melbourne course has come from further afield than I’d expected, with people registering from as far away as Canberra. There are still places available in this 30-place course, but if you want one of them, please register soon. 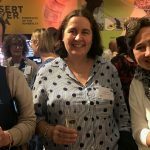 What does the Sounds~Write course involve? 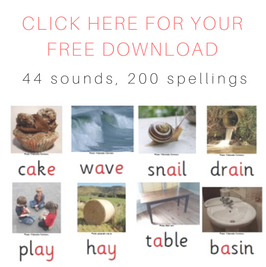 The Sounds~Write four day course provides everything you need to deliver top-quality, evidence-based teaching about sounds and spellings to learners of any age, from five-year-olds to adults. Lessons are short, fast-paced, tightly-focussed and cumulative, and can be applied in classrooms, small groups or with individuals. 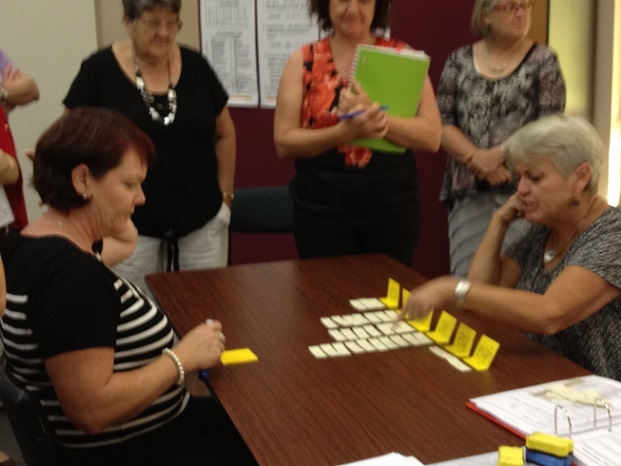 IMHO, this kind of training should be part of all primary teacher education. Teachers are constantly telling me that they’ve haven’t been taught much about the sounds of English, the logic of our spelling system, or how to work systematically from just a few sounds and letters through all the spelling patterns of English, to ensure that everyone learns to encode and decode with confidence. Teachers deserve better. 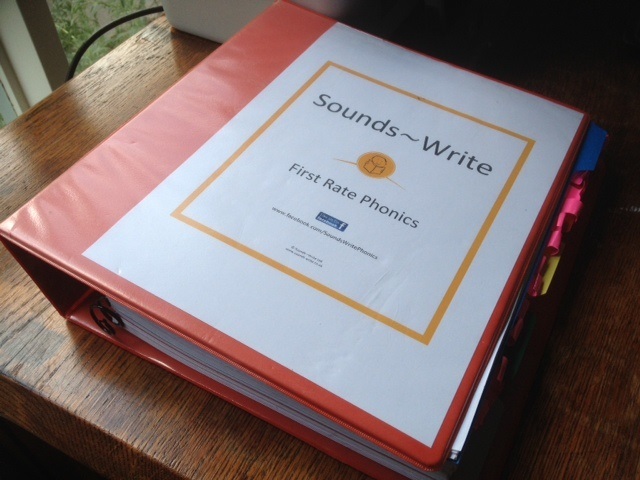 The Sounds~Write course is a nice mix of theory and practice, spread across four days. 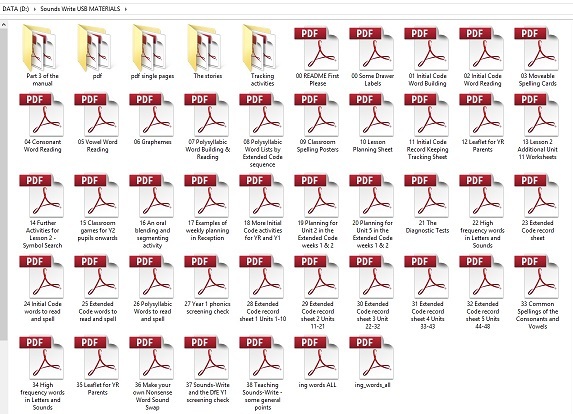 A huge folder provided to each course participant, and which you can’t buy without doing the course, contains all the lessons and other materials. Introducing Spellings with Two Letters. The eleven units in the Initial Code are taught using a mixture of these five lessons, starting with short, Vowel-Consonant and Consonant-Vowel-Consonant (VC and CVC) words with single-letter spellings, and working all the way up to one-syllable words with five sounds (CCVCC or CCCVC) such as “trust”, “print”, “spend” and “scrub”, and words containing consonant digraphs like “shift”, “lunch”, “thank” and “snack”. In schools using Sounds~Write in the UK, this is all taught and consolidated well before the end of a child’s first year of schooling. Where possible, it’s taught even faster to struggling learners. There are 50 Units in the Extended Code taught via these five lessons. I like this. Learners aren’t asked to waste time and cognitive resources continually learning new activities, the focus is new content. Having five different lessons affords some variety, and once learners are familiar with each lesson, the pace can be picked up for really efficient learning. 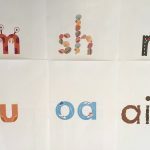 Polysyllabic words often get short shrift in phonics teaching, but they can be a source of major difficulty for learners, and deserve much more attention. There are lots of spellings that only appear in words with more than one syllable, but too often, “le” words like “bottle” and “middle” and Latin endings (-tion, -sion, -cian etc.) are about all that’s taught. 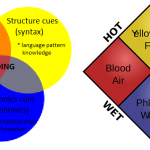 If I had to identify one thing I found the most valuable to me personally in this course, it was the strategies for teaching polysllabic words, which I now use constantly with older learners. The Sounds~Write course runs to a school day timetable (finishing by 3.30) and there is a short assignment to be completed each day to help consolidate learning. This is reviewed as a group the following day. Like everyone else, I hear and forget, see and remember, and do and understand, so I found doing the assignments very valuable. I still haven’t worked my way through everything on this USB and tried it all out, but what I have tried has been useful. Having a clear idea of how sounds and letters work, and a well-organised teaching sequence, should make it easy for teachers to identify where to slot other quality materials into literacy teaching that has Sounds~Write as its foundation. 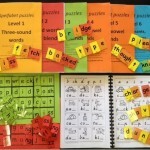 The Sounds~Write teaching sequence also matches the sequence followed by the Phonic Books. Who can attend the Melbourne training? Anyone who wants to better understand how sounds and letters work in English, so that they can teach this in an efficient, well-organised, evidence-based way, is welcome to attend. Teachers are the primary target audience, but I’d also highly recommend it to Speech Pathologists, tutors, parents and interested others. 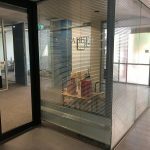 We wanted to make the course as accessible as possible, so the $660 Melbourne course fee is intended to just cover costs (venue, catering, materials and presenter wages, accommodation and travel). 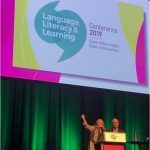 There is also a $30 discount for members of Learning Difficulties Australia and students, including recent graduates of teaching and Speech Pathology courses who want to give themselves an edge in the competition for scarce jobs. If you can find any other high-quality, participatory educational training that includes a whole literacy-teaching program for $165 per day, please let me know, because I want to sign up. Training of this type typically costs $400+ per day. I was originally doing all the course administration, but have recently had to register for GST, which would have added to course costs, so invoices and receipts are now being issued and payments accepted by Sounds~Write Australia (Mary). You can download a registration form from this website’s shop for free by clicking here, or contact me on spelfabet@gmail.com or 0402 075 306, and I’ll send you one. This entry was posted in Uncategorized on November 2, 2014 by alison. January. Please send me a registration form. How very kind of you to say such nice things about Sounds-Write, Alison. I can’t tell you how much I’m looking forward to the training in Melbourne in January – and not just because I shall be escaping the worst of the English winter! Funnily enough, I was training in Derby in UK yesterday and just happened to pass a little place called Melbourne, named after the famous lord, no doubt. Could I find references about this course somewhere?